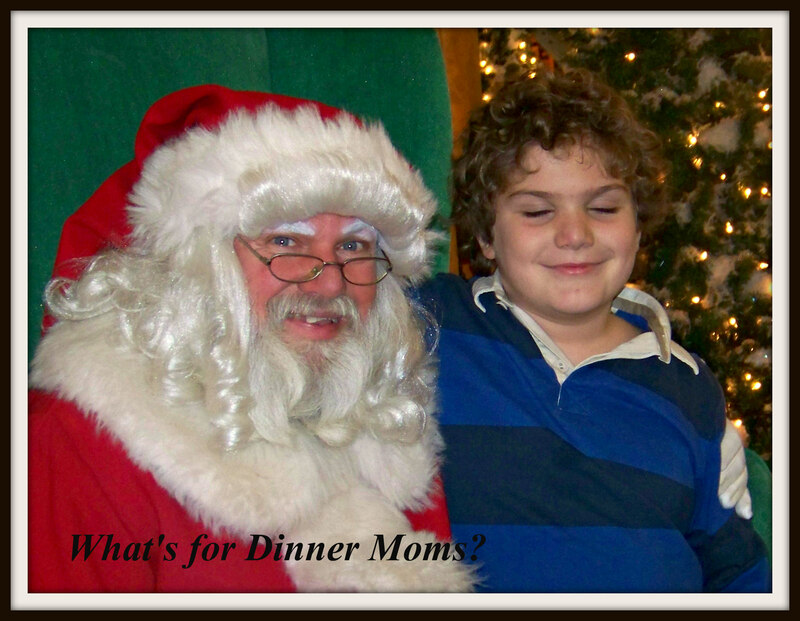 Saying Good-Bye… – What's for Dinner Moms? I love this picture. It is probably one of my ten favorite photos of my son. His eyes are closed but you can tell he is immensely happy and content. He loves Santa Claus. Halloween to Christmas is his hardest time of year. He loves the anticipation of the holidays and all its traditions. It sends his Autism behaviors off the chart though because he is so excited it is hard for him to control himself. We never really talked about Santa in our house. My daughter was about three years-old when one day she just told us that she thought Santa was an angel who encouraged us to give gifts to each other for Jesus birthday. Okay. We just kind of went with that for her. She never had a desire to visit Santa Claus or write him letters. My son has always been all about the Santa Claus. The lists, the gifts and the man himself. Visiting Santa was a big deal because we set aside a special day when my son got to go out by himself, without his sister tagging along, to visit Santa and have lunch somewhere special. But, last year he told us that he was now 11 and this would be his last year to go see Santa. He wanted to go see him one more time to talk to him and let him know he wouldn’t be coming back. There is a little house they set up down town that is perfect for small children. It has a bench Santa sits on and the children come in and get to have one-on-one time with Santa and then get a sweet treat. As my son entered the house he had to stoop down a bit. When did he get so tall? My son could no longer sit on Santa’s lap so Santa scooted over and made room for him on the bench next to him. Santa asked about what he would like for Christmas and if he had been helpful all year. My son gave him the list and of course told him he was mostly good. Then my son hesitatingly told him that he needed to say good-bye because this would be the last year he was going to come see him. Santa understood and they spoke for a few minutes. My son got his token for his treat and left the little house for the last time. This year I don’t have a child that is visiting Santa. I don’t have the circles in the toy catalogs or the list of misspelled items on a wish list. I love the young man he is becoming but sometimes I miss my little boy, Santa and the Easter Bunny. This made me tear up. How beautiful! What an amazing boy you have! Thank you! It makes me teary eyed every time I think about it. Wow! How amazing he recognizes he is growing up but like all of us just wants to stop the clock one last time. The part that really grabs me is that he wanted Santa to know this would be their last visit. I’ve felt that way at times when I have had to “move on” in my life: leaving a home I have loved, college commencements for the kids, anticipated vacations that come to end. One last moment in time and then a big leap of faith to the future that is hidden from our eyes. We share the same birthday and the same soul. Than you, Pat. He definitely is an old soul in a young man’s body. He fully understands time moving on and the desire to savor the moment. Keep that pic. I love pulling out pictures of my kids when they were younger with Santa. They are grown now, but love coming home and seeing these pictures scattered throughout the house. Thanks! I plan on it! I think I can imagine how you feel. They do grow up so fast. Too fast some days and not fast enough on other days. Sigh. This is soo soo soo sweet! My son is 12 and now is no longer a little boy or so he says!! I think it is awesome that your son is so mature in dealing with this special tradition for him. He sounds like a very special son and I have 4 older sons so it just gets better and better! Thanks for this heartwarming story! I hope this season is a good one for all of you! Thank you! Same to you and your family! Such a bittersweet moment…when everyone knows the magic of Santa is fading. It really is never quite the same after that, is it ? Your son sounds like a wonderful young man. How bittersweet for you but lovely that he is dealing with growing up in such a mature way. Thank you. He is definitely unique in being aware of what he needs. It was tough this year. I asked him if he was sure he didn’t want to go see Santa and he said, “No, I said good-bye last year.” A piece of my heart broke knowing he is really growing up.